In case you missed any, here is a list (and links) to my favorite and most read blog posts of 2017. Would you like to watch the sun rise over temples that date back to the 12th century? Does a tarantula kebab, scorpion salad or ant-stuffed spring roll sound appetizing? I'm in love with Japan. From the tranquil gardens and artistic sashimi plates, to the bullet trains and beer vending machines, it's a land where imagination flows freely. This week my sister and I set out on the ultimate adventure to take part in as many only-in-Japan experiences as possible. Whether you'd describe them as wild, cute, silly or bizarre, here's the list of our ten most unforgettable escapades. 1.) Cuddling a hedgehog, locking eyes with an owl and drinking pink milk with a maid. Themed cafés are all the rage in Japan right now. The lucrative sub-culture made its debut more than a decade ago with its first cat café in Tokyo; now there are 57 additional establishments where you can sip your coffee while petting a furry feline, along with others themed with bunnies, penguins and snakes. We visited hedgehog, Bengal cat and owl cafés which each provided the opportunity to interact with the animals and take photographs. We also grabbed a pink-colored milk drink at a maid café, @Home World, where the staff dressed in costume, talked with us at our table and performed on stage. 2.) Fishing for Lunch. Why just order lunch when you can catch it yourself? At Zauo Fishing Restaurant you eat what you hook and can have it prepared the way you like. During my fishing expedition I had my sights set on a mackerel that would run me about 9,800 yen, or about $10 dollars, unfortunately the seas were angry that day and I hooked a rather large sea bream setting me back nearly $75 dollars. Luckily my sister helped enjoy the catch which we had prepared half tempura and half sashimi style. 3.) Dining with Ninjas. Hidden down a dark alley, Ninja Akasaka restaurant provided the ultimate themed fine dining experience. We were greeted at the door by a masked ninja who took us to our own dimly-lit, bamboo-walled room with a traditional Japanese table and floor cushion seating. While various menu options are available, I went with the "All Black" set menu and was treated to eight courses of sublime, black-colored cuisine. The highlights included black soup with black dough shrimp dumplings, chicken cutlet with black panko crumbs and for dessert a custard covered in black berry syrup and garnished with black beans. Aside from preparing much of our meal tableside, the ninjas performed an incredible magic show in our room. 4.) Bidding at the Largest Tuna Auction in the World. We weren't involved in the actual bidding, but we were onsite by 2:30 a.m. to watch the flurry of locals survey and attempt to procure massive quantities of tuna at Tsukiji Market, the world's largest wholesale fish and seafood market. The auction began with the ringing of a bell and was an intense display of yelling and rapid fire hand gesturing. By 6 a.m. it was over and we needed to artfully dodge motorized carts, wheel barrels and forklifts to escape. 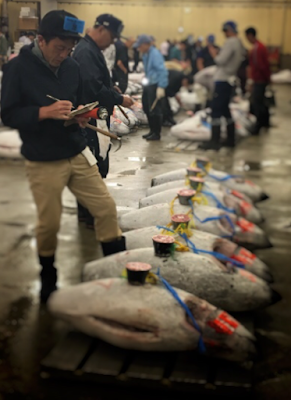 For a full post on the Tsukiji tuna auction click here. 5.) Renting a Puppy. In Japanese cities, real estate is pricy and limited; most people can't afford to own pets especially those that require outdoor space. Enter the rent-a-dog business. At Dog Heart beagles, poodles and golden retrievers are available to rent so that people can take them on walks to a nearby park or stay inside and play. The day we attempted to walk a rented dog it was raining so unfortunately the puppies couldn't come outside to play but we patted a couple and took a few doggie business cards for next time. 6.) Sleeping Overnight in a Space Capsule. Never have I been so excited to stay at a one-star hotel than after booking at the 9 Hours capsule hotel. Referred to as a human recharging station, this minimalistic accommodation has a futuristic design that includes 43 inch wide by 43 inch tall sleeping pods and lockers accessible by QR code. While the bed was hard and temperature warm, the capsule met expectations and provided for a solid night's rest. 7.) Cheering on Warring Robots. No visit to Tokyo would be complete without taking in a night show at the Kabukicho Robot Restaurant. An hour and a half of warring robots, psychedelic monsters, animated dancers and blinding lasers will have you questioning if someone slipped something into your beer and which way is up. While we didn't run into many locals, the show was surreal and we left with our heads spinning. 8.) Bathing in Coffee and Swimming in Red Wine. A two-hour train ride from Tokyo transported us to the mountainous town of Hakone within the Fuji-Hakone-Izu National Park. The park is popular with locals for its hot springs resorts (onsens) and is home to the world-famous Yunessun Spa. During our afternoon at Yunessun we indulged ourselves in hot spring baths mixed with coffee, red wine, green tea and sake. Aside from the overwhelming aroma, the coffee pool was our favorite and left our skin feeling especially soft. Read more about our visit to the spa and Hakone area by clicking here. 9.) Playing Pachinko in a Retro Arcade. While gambling is illegal in Japan, there's always a way to beat the system. Pachinko is the nation's alternative to slot machines where players win prizes - some of which can be "sold" at neighboring establishments for cash. Pachinko is similar to pinball in that it involves the pressing and releasing of spring-loaded levers to launch metal balls into targeted slots. I didn't win any prizes this time but may try my luck again at one of the many noisy, fluorescent-lit pachinko parlors found on nearly every city street corner. 10.) Bumping Bellies at Sumo Practice. Our last morning in Tokyo, my sister and I wanted to experience something a bit more "traditional Japan." There weren't any sumo tournaments scheduled but we managed to get in on an early morning sumo practice at a local stable. Along with only a few others, we watched as the wrestlers hit each other to allow evil spirits to leave their bodies, and also as they stretched, trained and took part in mock matches. While action-packed, observing the ritualistic chanting and repetitious maneuvers felt strangely meditative. We also learned about the life of sumo wrestlers and some of the sport terminology which you can read by clicking on this link. While we were together in Japan for less than a week, the time my sister and I spent there was intense cultural immersion. We each now have a greater appreciation for the Japanese people and the extreme interests which truly make them unique. Tsukiji Market is the world's largest wholesale fish and seafood retailer. More than 400 different kinds of seafood can be found at the market from seaweed and sardines, to caviar and tuna. The total value of the merchandise handled on the premises surpasses 600 billion yen or nearly 6 billion U.S. dollars annually. The market opens daily beginning at 3 a.m. to greet ships, planes and trucks delivering catches from all over the world. Aside from strolling through the market stalls, the most popular visitor attraction is the tuna auction. If you are interested in observing the world-famous auction, follow this seven-step guide to make the most of your visit. 1.) Get your plan together ahead of time. The day you plan to visit will start early. The auction begins before the Tokyo metro starts service so you'll need to either stay at accommodation within walking distance or pre-arrange a taxi service. Check the schedule ahead of time; the auction doesn't take place on Sundays, many Wednesdays and when a tropical storm is looming. 2.) Get there early. While the actual auction begins at 5 a.m., visitors begin queuing outside of Osakana Fukyu Center as early as 1 a.m. in peak season. Only two groups of 60 visitors are permitted into the auction each day and no reservations or group tours are allowed. 3.) Get in line. When you see a line forming for the auction, get in it and stay in it. Spots are precious, and policemen take their jobs seriously monitoring tourist behavior and regulating the number of visitors permitted. Anyone suspected of being intoxicated is not allowed into the auction so forget about your plans to stay up all night. 4.) Get comfortable on the floor. If you are lucky enough to be one of the 120 visitors granted a spot, you'll be sequestered inside a small building. You'll be provided a high-visibility vest and instructed to wait. Secure a spot on the floor and try to get as comfortable as possible. About thirty minutes prior to being escorted into the market, an experienced bidder provides an orientation about the market, the auction and the tuna trade. Have your questions ready. 5.) Get up close. At 5:25 a.m. the first group of visitors is escorted into the industrial area where the tuna auction takes place. The tuna are put on display for perspective bidders to survey prior to the event. Both fresh and frozen tuna are included in the auction and buyers analyze the fish quality by evaluating core samples placed atop the fish. The auction begins with the ringing of a bell and is an intense display of yelling and rapid fire hand gesturing. Try to finagle your way close to the front to get the best view of the action. 6.) Get out of the way. On your way to and from the auction, your group will be escorted by policemen through a massive industrial warehouse complex. The area is a buzz with motorized carts, wheel barrels and forklifts. The vests are no defense against the moving equipment and rushed workers so watch where you are going and respect the business going on around you. 7.) Get out of there. By 6 a.m. the auction is over and it's time to leave. Most likely you'll have had enough of the fishy smell and noise, but if you still haven't gotten your fix, stop outside the auction area at one of the many seafood stalls to sample a fresh catch. The Tsukiiji Market and tuna action is an incredible display and worth the time to enjoy the show. Due to its popularity and safety concerns associated with the current arrangement, the local government is considering moving the market outside of Tokyo. Ensure you have the latest information before planning your visit.